Finding good tasty and healthy salty treats can be tricky especially if you are travelling. I for one, have always preferred salty to sweet food. Have you ever noticed how there isn’t much salty snacks or treats out there? It is a conspiracy, I tell ya! All the protein bars are sweet goowy lumps with the usual culprits, the all-pervasive peanut butter, chocolate. You have cookies, muffins, bars, but not much salty stuff. Sure you have potato and corn chips, roasted salted nuts and pretzels but it works if you want a mega dose of sodium in your system and virtually no nutritional value. That’s not what I am looking for! That is until I found this amazing recipe and played with it. You can use any beans you like. 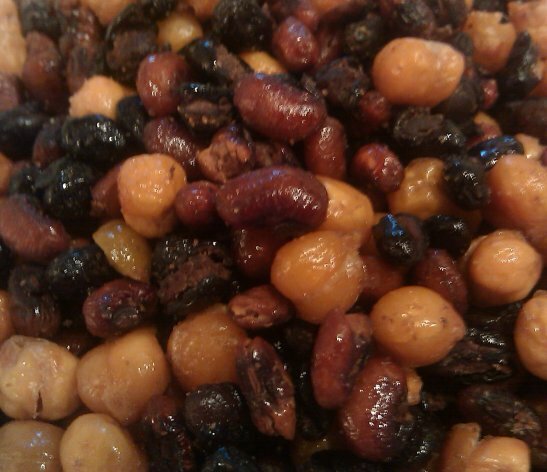 I used 1 can of garbanzo beans (good source of healthy fat), a can of black beans, a can of red beans. If you use canned beans, rinse them well several times making sure that you don’t damage them in the process. If you prefer cooking your beans, do it the day before. Pour all the rinsed beans into a large bowl. Sprinkle with garlic salt, any dried herbs you like (garlic, pepper, French herbs) and some olive oil is perfect. Mix gently with your hands making sure again that you don’t damage them. Pour on a baking sheet making sure you have a single layer and the beans don’t overlap. Bake for 40mn at 350F. After 20mn, mix it up a little so that the beans are cooked all over. Let it cool before serving and tasting. You can pour them on a paper towel if you want to remove some of the oil so it is cleaner to handle when you eat them. Store the mix in a ziploc bag after they are completely cooled off. It keeps forever, well just about! Some of the beans will be dried, others will be lightly crisp. No two bites will be alike. Since I discovered this great recipe, I always carry a small ziploc bag with some in them in my purse, just in case I need a little energy boost. That’s is such a cool way to get a shot of protein! Get creative, you can try all kinds of seasonings (Mexican, Indian, Chinese etc). If you like a little cheesy taste, sprinkle some nutritional yeast on top. Go to town and let me know if you have come up with some really cool seasonnings.